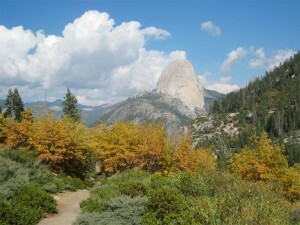 I have been to Yosemite National Park many times, but never during the fall. The park is much cooler in the evening but the days can be sunny and warm, but you can never predict Mother Nature around this time of the year. 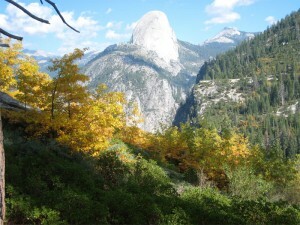 However, the fall brings some welcome beauty and colors to Yosemite Valley. Also, there tends to be a lot fewer visitors in the park so the trails were less crowed which for us all, is always a welcome feature. Arriving into Yosemite Valley through HWY 41 can be a whole lot of fun if you have a good handling vehicle and are feeling bit like Mario Andretti. The highway has some of the best curves along the way encouraging an ever faster pace; I’m known to have a lead foot. Vehicle traffic during October is much lighter going into the Valley, so I’m sure I would not have been able to zip along the same way during the summer months. Upper Pines campground was the only site available to reserve for the weekend we wanted to camp. Camping in Yosemite Valley can be much like tail-gate camping. Many campers use camping trailers giving the campgrounds that parking lot look and feel to the site. The individual sites are quite close together so you simply have to hope that your neighbors are quiet and friendly, and aren’t serial killers. But in October there are mostly retirees that just quietly hang-out and go to sleep early. Well, it’s not Animal House but it’s good from a naturalist point-of-view. Peace and quiet in the forest is always welcome. Enjoying the evening sounds of nature is always a great thing until your campsite neighbors decide to turn on their generators; now that’s camping! Lucky for us our neighbors were very conscientious about their generator so every night was peaceful. 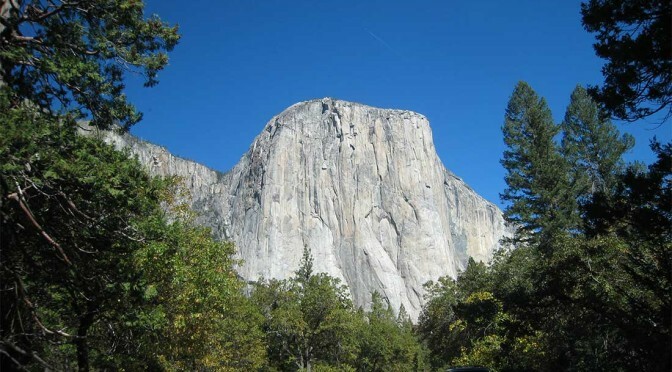 If you are not an aggressive hiker or climber type, Yosemite Valley has many beautiful areas to visit and enjoy. Yosemite Falls is a short walk from the main valley shuttle stop, so most visitors will stop at this site. The shuttle system is handy way to get around the valley, but I found they don’t run exactly on schedule so sometimes you are waiting longer than the 15-20 minutes that the park states. There are some beautiful meadows in the valley to relax in, have lunch, take a nap, and enjoy views of Yosemite Falls, Half-Dome, and the Merced River that meanders through Yosemite Valley. Since it’s very easy to get around the valley, there will be a lot more people around, but in fall the human traffic is not a problem. When you come to Yosemite during the summer, you have full rivers and streams with hot dry days, but during the fall you have less water, cooler days, and amazing fall colors to see, so it just depends how you like it. Yosemite Valley has some beautiful and great features to visit and see, but we always prefer the longer hikes and follow the trails to more distant attractions. Glacier Point is a great place to get views of Yosemite Valley, Half-Dome, Nevada Falls, and Vernal Falls. This is where you can start a hike on the Panorama Trail which eventually hooks up with the John Muir Trail. There is a small parking lot at Glacier Point, and there is a shuttle service out of Yosemite Lodge that can take you on a one-way or round trip ride to the point. We paid $25 for a one-way shuttle ride because we were starting our hike along the Panorama Trail and working our way back to the Upper Pines campground. Unfortunately, the first shuttle of the day does not get to Glacier Point until about 10 am, so the early risers will need to have someone drop them off at the parking lot in order to get an earlier start. Even so, the later start still gives you plenty of time complete the hike before it gets dark. From Glacier Point you get views of the Valley, Half-Dome, Nevada Falls, and Vernal Falls. And from this point you can begin a longer hike along the Panorama Trail and hook up with the John Muir trail and make your way up into Little Yosemite Valley, and further. As you walk the Panorama Trail you will see excellent views of the east side of the valley. Half-Dome dominates the background as you descend 1300 feet down to Illilouette Falls which continues past a small tributary and starts to ascend the 800 feet up the next ridge line that will eventually lead you to Nevada Falls and the John Muir Trail. We did the 8.3 mile hike starting at Glacier Point and looping back to the valley and the Upper Pines campground. The hike had a couple of strenuous sections, but it wasn’t too difficult, and there were plenty of retirees making the same trek, so I think most people would not have too much trouble with the hike. As usual, take plenty of water and some kind of snack or a lunch because the hike could take 5 to 6 hours. If you are staying in Yosemite Valley and are in reasonable shape, I would highly recommend doing the Panorama Trail. When camping I like cooking over the fire-pit and enjoying the campsite atmosphere. The large bear boxes allow plenty of room for food and coolers, so food storage is not a problem. However, I know some prefer not to deal with cooking and the clean-up afterwards, so there are a couple places to get prepared meals. Yosemite Lodge has a cafeteria like eating area that has decent food at a reasonable price (considering we are in a National Park). It was nice to see the park was not gouging visitors with highly inflated prices. Curry Village will have a more limited menu, and the Yosemite General Store will have groceries and some packaged sandwiches. For me, I think part of the camping experience is the enjoyment that comes from cooking around the campfire with your friends, and just being in the outdoors. Also, there is nothing like the taste of a burger or steak grilled over an open wood fire. If you feel a bit dirty after your day in Yosemite Valley, there are some showers available in Curry Village. We found that the showers are free unless you need to rent a towel then they will charge you $8 for the towel. We could not find any specific information regarding these showers and after asking around we learned that many people were not aware of the showers, so they were not busy at all. 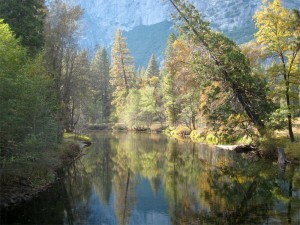 This was the first time I have visited Yosemite Valley in the fall. I’m glad I did visit during this time of year because the fall colors are simply beautiful, and of course, the smaller crowds make it all much more pleasant. I’m not big on campgrounds that have that “parking lot” feel, but the hikes and views around the valley are well worth it. At this time of year the weather can get a bit unpredictable, but I think we were lucky. The temperatures were in the mid 70’s during the day, and got down to the low 40’s in the evening. So I recommend if you get cold easily, than make sure you have warm clothing and sleeping bag for the night chill, and build a good fire.